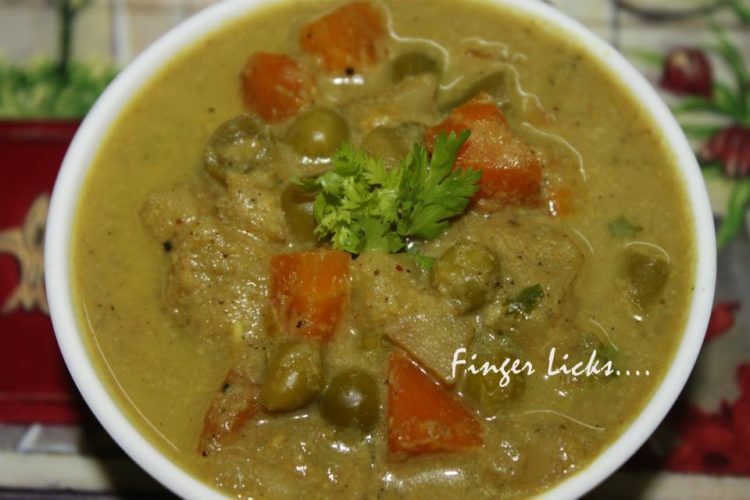 Mixed Vegetable Kurma is a common and famous curry dish which is mainly cooked in coconut milk. There are plenty varieties of kurma using both vegetables and non-vegetables. I have made kurma with vegetables, chicken and mutton. This is a main recipe in north Indian and mughlai cuisine. But the taste and flavours are various in various areas recipes. Some cuisine use varieties of ingredients and combinations. Some cuisines use coconut milk while others use cashew or other nut pastes or their combinations for the flavours. There are sweet and savoury flavoured kurma recipes. This is the spicy and savoury version of the kurma made with using only vegetables. This is my style of preparing mixed vegetable kurma, moreover a Kerala style nadan kurma in which I have used thick coconut milk and the cashew nut paste for the cooking. Coconut milk will give the curry an extra ordinary flavour and aroma while cashew nut paste will make it more creamier. So that I am sure that you cannot stop eating it. You can serve this kurma with any Indian roti, where I served with our favourite “palappam”. Choose wisely and enjoy. Cut potatoes and carrots into small cubes. Soak cashew nuts and fennel seeds in 1/2 cup of warm water for half an hour. Grind this along with coconut into a fine paste and keep aside. Heat oil in a pan and add whole spices and roast till there is a nice aroma. Now add onion,green chilly,salt and saute till it becomes transparent. Add ginger garlic paste and turmeric and fry for a minute. Add coriander powder, and pepper powder,vegetables, coconut milk and one cup of water. Cover and cook till the vegetables are tender. Remove lid and add the coconut cashew paste and simmer in low flames for two minute. Finally add garam masala and garnish with coriander leaves. Serve hot with chappathi/ appam.